CAPITB Trust’s Chairman has been recognised for his outstanding service and contribution to the textiles industry. 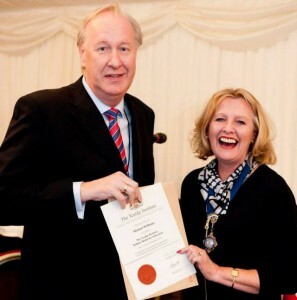 At the annual Parliamentary Lunch, hosted by The Lord Haskell CompTI on the 21 November 2014, Mike Williams received the Holden Medal for Education award. This lunch was attended by guests from across the UK, Bangladesh, Germany, Palestine and Turkey. The day opened with Lord Haskell welcoming guests and providing an update on the House. Guest speaker Sir John Peace, Chairman of the Board of Burberry and Standard Chartered Plc, also spoke of the importance of retaining a skilled workforce in the UK through apprenticeship schemes and the part that The Textile Institute should play in this. Then Helen Rowe Comp TI CText FTI, Chairman of The Textile Institute, came to the stage. She began by congratulating Wuhan Textile University on the success of the recent World Conference in China and also informed guests that the TI will be launching a new programme of short courses in the New Year titled ‘An Introduction to Clothing’, which CAPITB Trust have also supported. These courses have been developed to help fill the skills gap and provide training for the industry. Helen then went on to present the prestigious Holden Medal for Education award to Mike Williams, Chairman of CAPITB Trust. This was awarded in recognition of an outstanding contribution to technology based education at all levels, recognising Mike Williams for his 24 year service to the Clothing Industry. This began at Dewhirst as Managing Director of Sportswear Division where he was responsible for business development with iconic global sportswear brands, building it to a highly significant and profitable business within the group. Since 1998, he has been an active member of the Board of Trustees of CAPITB and its Chairman since 2010. The Trust has supported a number of Organisations with their training initiatives, including: Huntsman, Hawick Knitwear, Behop Dancewear, The Scottish Textile Association, and The British Fashion Council. The Textile Institute Service Award, which was posthumously awarded to Dr Peter Dinsdale CText FTI and presented to his wife Mrs Inge Dinsdale. The Textile Institute Research Publication Award was awarded to ‘It’s Vintage Darling!’, an exploration of vintage fashion retailing’ written by Dr Julie McColl, Catherine Canning, Karinna Nobbs, Louise McBride and Linda Shearer. The Companionship Award was given to Mr Gordon Thompson CText FTI in recognition of his advancement of the general interest of the textile industry. Everyone at CAPITB Trust would like take this opportunity to congratulate all those that won awards at this year’s prestigious Parliamentary Lunch.